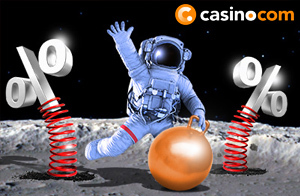 Join Casino.com this month and get on board to hop your way to bonus success. There are bonuses and cashbacks galore up for grabs during the Bonus Hopper promotion at Casino.com, which will run from now until Wednesday, March 21st, 2018. The promotion has been divided into three weekly segments, and each week you will be treated to a weekly reload bonus, along with an extra cash back. Stick around for the action from week to week because the bonuses will just get larger and larger. How much can you win at Casino.com? Week 1: By using the bonus code HOPPER, you can grab an extra 25% up to R600. If you claim this, you can be eligible for a 10% cashback up to R240. Week 2: By using the bonus code BOUNCE, you can claim an extra 25% bonus up to R1,200. By claiming this bonus, you will be eligible for a 10% cashback up to R600, as long as you were playing on your mobile device. Week 3: Use the bonus code BIGBONUS to grab 50% extra up to R1,200. Claim this bonus to be eligible for a 10% cashback up to R1,200 on the epic gladiator games available at Casino.com. • The promotional weekly sectors being on Thursdays at 00.01 and run through to the following Wednesday at 23:59 GMT. • To take part in this promotion, you will have had to claim the welcome package at Casino.com. • Betting restrictions on bonus funds exist. • To be eligible to claim the reload bonus, you will need to enter the bonus code when making a qualifying deposit. The bonus will be added to your account immediately. • Bonuses can only be claimed once per player during weekly promo period. • Only House takings from real money bets during the weekly promo period will count towards cashback credit. • Cashback is credited to your account within 2 hours of the end of the weekly promo period. • Minimum cashback in the promo period is $1 if the House wins. • Cash can be instantly redeemed with 0 x wagering.